Cooking Tongs might just be the most used tool in my kitchen! I purchased my first pair of kitchen tongs (not to be confused with those extra long barbecue tongs) in a kitchen supply shop. They only cost me about $8.00 but are one of the most utilized utensils in my kitchen. 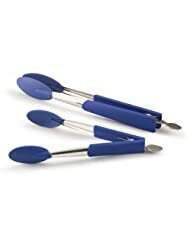 Great for sautéing, transferring ingredients to hot pots & pans, plating meals, and any other chore that may require putting your fingers in harms way. They’re also great for keeping a beat when cooking and listening to loud music.